Open Studio Project presents Interact. Over the past several years I’ve created a series of pieces that encourage audience engagement through participation. These works utilize touch pads, laser beams, infrared beams, clay, scratch tickets, puzzles, watercolors, found objects, and more. Four of these pieces will be on view tomorrow as part of Interact: “Catalyst”, “Eleven Conversations”, “Puzzle Pieces”, and “Scratch Sound”. Open daily with unpredictable hours or by appointment. I hope you can make it out. Save the date for my August 1 opening at Gallery 4Culture. Please come to the opening of my new gallery space. The Open Studio Project will be an exercise in exploring, trying, presenting, and leaning into the sharp edges. I’ll have this space for the next several months through the help of Storefronts Seattle. Through OSP , I’ll present visual art, music, video, interactive sound and video installations, and site-specific work. I also look forward to other projects that may be thought of by you, me, or anyone else that dances differently. I’m excited to have my good friend and past collaborator Rulon Brown present a new interactive installation entitled RESTLESS. In addition to the installation, he will debut his new jewelry designs and present nightly performances starting June 6 at 5:30 pm, First interactive performance w/ repeat shows every half-hour till 8:30 pm. The shows continue 6 pm nightly through June 16. You may remember Rulon; he is the leader of the band I toured Nicaragua with earlier this year. I will play a special matinee concert, 2pm, Saturday, June 15 with Rulon, Jeff Busch, & Bill Horist. We will play Rulon’s music that we toured in Nicaragua. I’m really excited about this space, and all the possibilities. I hope you will join us! I’ve just finished a tour in Nicaragua with my friend’s band. Rulon Brown brought me along with Jeff Busch, and Bill Horist. This was the last concert as part of the Nicaraguan International Jazz Festival. I had a fantastic time, and I look forward to returning sometime again in the near future. After returning from Nicaragua, I will have a series of performances and visual art shows. As part of my residency at the University of Puget Sound, I have just presented a new work this week. The Race & Pedagogy Initiative presented "American Voices: Invisibility, Art, and Educational Justice". Over the course of two days this week, I presented this new work five times in schools and in a prison. This piece addresses the school-to-prison pipeline. Shortly after these performances, I will be performing at the True False Film Festival in Columbia, Missouri. This festival is quite different because they invite musicians from all over the world to play prior to each film screening. I'm excitedly looking forward to my first solo visual art show at Catherine Clark Gallery in San Francisco. If you happen to be in the Bay Area, I hope you can make it out. The show will be running from March 2nd – April 20th. Unfortunately I will miss the opening reception due to other tour dates, but I will be in attendance for a closing event on April 20th. My latest completed public art project is a sculpture at People's Park in Tacoma, WA and is currently on view. During a two-year residency in Tacoma, I worked with a diverse group of young people discussing and writing about human rights. I incorporated these writings in this new sculptural work. An image of the final project is attached. 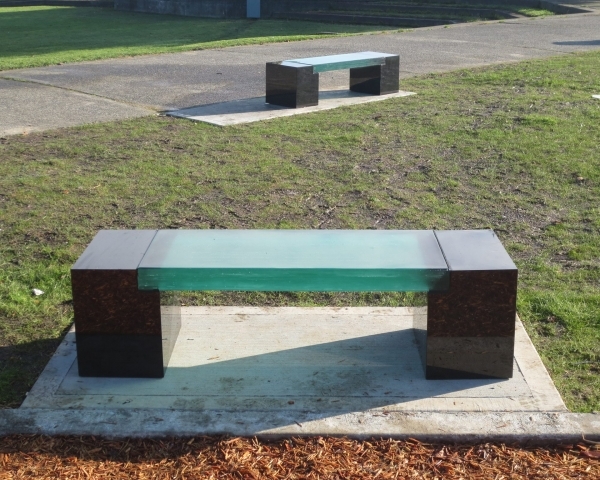 The three benches at People’s Park are installed in a triangular configuration (two of which are pictured). When I created the design, I hoped that the writings would promote conversation about human rights. I've been told this has already started. A public celebration will take place in the park in May. I’ll be a featured speaker/artist at the Race, Education, and Criminal Justice Conference at the University of Puget Sound in Tacoma, WA (see below for details). I’m currently at Headlands Center for the Arts for a residency. It’s beautiful, and I feel very fortunate to be here. I’m developing my Creative Capital project, Recapitulation. Previews of some of this work will take place early next year. I just received the Conductive Garboil Grant, which Su Job created before her untimely death in 2008. A special thank you to her for her vision and generosity. This grant is awarded to artists that, “demonstrate a profound ability to challenge the limits of conductive creative discourse and its effects on our society, pushing the creative act beyond the accepted limits, definitions, or purposes of art while engaging audiences outside the aesthetic industrial complex.” I’ll be recognized for this award at Artist Trust’s 2012 Awards Party, November 1st. I’ve received a few other awards this year, including an Individual Artists Projects grant from 4Culture. I’ll use this grant to create a new body of work, Assassins, which will be featured in Gallery 4Culture. My TEDx Tacoma talk from earlier this year can be seen here. If you happen to be in the Bay Area, Headlands Center for the Arts is having a free open house October 28th from 12pm-5pm. Hope all are well. I’m really excited about the new year. I was recently awarded a grant from Creative Capital for a new work entitled Recapitulation. Recapitulation is an installation demonstrating the parallels between slavery and the contemporary prison industrial complex through animation, digital stills, sculpture, original music compositions, interactive sound and video. I’m honored that my project has been chosen for funding. I also recently received an AiR Award from the Headlands Center for the Arts in California. Current visual art shows include my piece Four Score at the Tacoma Art Museums as part of the 10th Northwest Biennial. Proliferation is on view in Tulsa, Oklahoma at the Living Arts Gallery. The show, entitled EYE 4 EYE, present works addressing capital punishment. Upcoming performances include Hollow Earth Radio’s Magma Festival, SAM’s ReMix, and a concert from curator Steve Peters commemorating the 100th Anniversary of the sinking of the Titanic. In addition to performing for this week’s Artist Trust auction and an upcoming performance for students at Dimmitt Middle School, I’m also looking forward to returning to perform for the Stafford Creek Corrections Center’s Black Celebration event. I will also be performing at a TEDx talk in Tacoma this spring. As part of the Biennial in Tacoma, I’ll be offering a musical performance sometime over the next few months. I’ll keep you posted. This spring I’ll be in residence at the Boys and Girls club in Tacoma, WA continuing to work on the Human Rights Legacy project, and collaborating with the multi-talented Tilson and Hollis Wong-Wear. I’ll work with students on music and spoken word. A short documentary film will be competed for this project as well as the installation of interactive glass benches in Tacoma’s People’s Park. Again, I’m really excited about this year. I really appreciate your support. About 5 years ago I started a work entitled Project 12. For a full year I presented one new visual art show each month, as well as performing 40 concerts. More than 331 days of visual art was presented that year. It was an endurance exercise to play catch-up on doing something I truly love doing. This year, and over the next few, I look at embracing new genres and new mediums. I really appreciate your support of my explorations. I hope to see you sooner than later. Hope all are well. This weekend is Bumbershoot 2011, Seattle’s Music & Arts Festival. I was commissioned to create the fine arts poster for the festival this year. I also wrote a short three-movement composition to accompany the graphic score. Sustenance consists of contrasting parts titled Nourishment, Endurance, and Strength. Next week I’m continuing with my series of interactive performances by presenting Scratch Sound as part of the show Game Theory at Cornish College of the Arts. 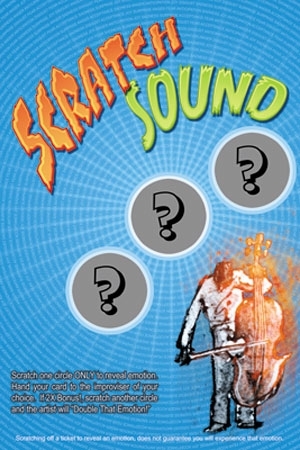 Scratch Sound is an interactive performance utilizing custom-made scratch tickets that determine the mood of the improviser. A performance of Scratch Sound will take place October 14th in the Cornish Gallery. I’m working on a public art project in Tacoma, WA that focuses on the human rights legacy of the region. I’ll be in residence at Hilltop Artist at Jason Lee Middle School, working on a piece for People’s Park. This school is amazing, and I’m honored to be working with the students and staff. In October, I’ll be back in the Bay Area working with We Players on Alcatraz. I’ll also be in residence at Head Royce School in Oakland for a couple of days performing and visiting with classes. In addition to these events, I’m participating in Authorship, an experimental series of events at The Project Room on Capitol Hill here in Seattle. I’ll also be performing in Tacoma for the Fall Free For All arts festival.